Rev. Annemarie S. Kidder, who holds a Ph.D. from The Southern Baptist Theological Seminary, delves into the importance of solitude in “The Power of Solitude: Discovering Your True Self in a World of Nonsense and Noise.” Solitude isn’t highly valued in our society. As Eugene H. Peterson writes in the “Foreward,” “We thrive on numbers and noise.” Yet more and more people, perhaps because of all the noise, are rediscovering its treasure. Jesus offers us the example of solitude. “Physically, emotionally, and spiritually exhausted by the crowds that pursued him wherever he went. Jesus regularly sought out a time and place apart. In communion with God in solitude from his demanding everyday life, he refreshed his body and spirit so he could continue his work with those seekers of healing and hope who crowded around him.” Embracing solitude allows us to “connect with God” as well. Even in marriage, the most intimate of human relationships, we are called to have that space apart from the other and to respect the other’s solitude as well. Kidder discusses our longing for connection. At the core of that longing is our desire to be reunited with God. In this world, however, we often try to fill that longing with replacements that never quite measure up. While not devaluing marriage, she does offer a criticism of romantic love. “Romantic love and its accompanying illusions draw us away from our center, from the soul’s availability to God, from connecting with God in the here and now in a joyous and playful way.” She does make quite the case for celibacy for spiritual reasons. Yet, despite her emphasis on solitude, Kidder also acknowledges our need to be part of the larger Christian community. Through communal worship, for example, we are placed in “the presence of our brothers and sisters in Christ. It takes a visit onsite to experience the messiness of human vehicles acting as divine messengers and unpredictable, yet irreversibly appointed, members of Christ’s body.” In addition, we are called to practice the works of mercy for our fellow humans, a call which of necessity brings us into community with others. “The Power of Solitude” is an interesting, readable work. It offers an antidote to the craziness of our world, and encourages us to reclaim this important aspect of our being. I read Lisa Hendey's blog faithfully. The owner of the Catholic Mom website, she and I have worked together the past few years. We live 3000 miles apart but I think we are kindred spirits of sorts. We seem to have similar ways of dealing with things, are both the mothers of two sons, and do web design when we are not working on supporting women in their faith journeys. She is about 10 years further along in life than I am, and as a result, I definitely consider her a mentor, both professionally and personally. She has been married 21 years (today!) and her oldest son is just finishing his first year of high school. I loved her post today What's in Your Yearbook?. As David finishes up Kindergarten next Thursday, this has been a truly memorable year for all of us. There were truly times I didn't think any of us were going to make it. There was definitely a learning curve for all of us. It was a new chapter in our lives and now it seems I will be beginning another new chapter. I have been offered a part-time position as "safety officer" in our parish, basically making sure that all parish and school volunteers have had their background checks done and have been trained in spotting child abuse, and keeping records. In exchange, David's tuition at the school will be waived. How could I say "No?" Accepting this position means that I needed to put Isaac in pre-school for next year. I have mixed feelings about that. I know he is certainly old enough to go to school. I also think he will have a good time with the other kids. I do worry that he won't be challenged intellectually. On the plus side, it is only three days a week which means he and I can still bond over Monopoly games and multiplication two days a week so hopefully he won't lose his advanced ability. He is excited, though, about being able to go to school with his big brother. So, I will be returning to the world of outside work and my two boys will both be in school. It looks like next year will be an adventure as well! Each day when we pray the “Our Father,” we utter the words “Forgive us our trespasses as we forgive those who trespass against us.” Think about that for a moment. Do we really want God judging us by the same standard by which we hold others accountable? Ouch! It is easy to give lip service to the idea of forgiveness. It is much harder to actually do it. People hurt us on an almost daily basis. Some of the slights are small. Someone might cut us off in traffic or be unkind to us in a thoughtless moment. Some wounds are larger. A person purposely hurts us or sets out to spread malicious gossip about us. Some injuries seem truly unforgiveable. Someone we love is murdered. Someone abuses our child. A drunk driver hits a car, killing your best friend. A spouse has an affair. When we need to forgive and are finding it difficult to do so, we can take a lesson from Immaculee Ilibagiza. Immaculee spent ninety-one days hiding in a tiny bathroom with seven other women during the Rwandan Holocaust. She tells her heart-wrenching story in “Left to Tell: Discovering God Amidst the Rwandan Holocaust” (Hay House, 2006) She could hear people being killed outside the door. She spent much of her time in prayer but anger still filled her heart. She wanted the people who were perpetrating these horrific crimes against her people to die. prayed for God to receive the child’s innocent soul and then asked Him, “How can I forgive people who would do such a thing to an infant?” . . . She says that she heard an answer: “You are all my children . . .and the baby is with Me now.” . . . It was such a simple sentence, but it was the answer to the prayers I’d been lost in for days. She began to forgive and that forgiveness allowed her to regain her trust in God. Immaculee continues, “Despite their atrocities, they were children of God . . . I knew that I couldn’t ask God to love me if I were unwilling to love His children.” When she was finally able to leave the bathroom and escape to a French military camp, she learned that all of her family had been brutally killed. She later went to a prison to forgive the man who killed her mother and brother. I can’t even imagine that kind of forgiveness and yet that is the kind of forgiveness that God calls us to. Immaculee’s story is something to think about the next time we are called to forgive someone who has hurt us. do not stint the first fruits you bring. and be cheerful as you dedicate your tithes. he will reward you seven times over." This first reading today reminds us yet again of the importance of generosity. All that we have and all that we are come from the Lord. Some people protest against charity, saying "I have earned it. Why should I give it away? It is mine to spend how I so choose." Yes, you have earned it, but only because God gave you life and intelligence and the physical ability needed to earn the money. Everything we have is a gift from God. We are merely stewards of his gifts and as such need to then share with others. Being generous is one thing. Being a "cheerful giver" can be an even greater challenge. It is not always easy to turn over money to the Church or to a favorite charity, especially when money is tight. I have always found the last part of this Bible verse to be true, however. God does reward generosity and other people in turn have been very generous with me. As many of you know, I write a column for Catholic Exchange. A few weeks ago, I had submitted my article on "Can Moms Afford Not to Work?" My editor asked me to do additional research and do a rewrite. I took advantage of this long weekend to read Leslie Bennetts' book "The Feminine Mistake." The premise of her book is that women who opt-out of the workforce to raise their children are making a huge error. It was painful to read this book. Even though she raises some valid concerns, she was so incredibly insulting to stay-at-home mothers. I'm not even kidding - at one point she described us as "parasites." She just couldn't understand why young intelligent women would ever want to take care of their children. Her whole attitude is one of "What a waste!" The only concept of equal marriage she accepts is one in which both partners contribute greatly to the family coffers, confer on all financial decisions, and share parenting duties. While that may certainly work for some couples, it is not the only model of a successful marriage. She also argues that many women take the "easy way out" when they have children because they couldn't hack it in the workplace. While it was hard for me to leave my job, it is not a decision I ever regretted. I didn't leave because I couldn't hack it. I left because leaving David with my parents or Bernie wasn't working. They were both getting frustrated with the situation. For the case of family harmony on all fronts, I felt it was important for me to be the one responsible for his care on a full-time basis. I did have an identity crisis after leaving paid employment. I was forced to discover who I was as a mom and as a women. I was forced to discover my worth as a human being outside of a paycheck. It also opened up new avenues for me. I wouldn't have become a professional writer if I hadn't been compelled to pursue new avenues for my life. I probably never would have made use of my master's degree. Going into business (a small business though it may be) for myself forced me to learn about entrepreneurship. Motherhood has made me a more multi-dimensional person, not less of one. Most importantly, I have had the opportunity to really get to know and educate my children in a way that just wouldn't be possible if I saw them only a couple hours a day and on weekends. Can Moms Afford Not to Work? I generally stay out of the whole stay-at-home mom vs. working-mom debate. I believe nearly every mother gets up in the morning and tries to do the best she can for her family with whatever working arrangement she has. Motherhood is hard enough without attacking those, or fending off attacks from those, who make different choices. There is a new book, however, that raises some issues that are definitely worth responding to. In “The Feminine Mistake,” Leslie Bennetts argues that younger women, such as myself, who have opted out of the workforce to raise our families are making a colossal error in judgment. Her argument is based purely on economics. Her overwhelming position is that “a man is not a financial plan.” As her many anecdotes relate, men have a way of leaving through either divorce or death, leaving women to fend for themselves when they are ill-equipped to do so. The vast majority of women that Bennetts profiles are wealthy suburbanites. They are highly educated. Many have professional career experience, but they have given it up to raise their children and support their husbands in their own six-figure careers. Bennetts maintains that becoming a stay-at-home mom is “an economic choice with potentially dire consequences”, arguing that “even taking three years off will cause a 37% cut in earnings compared to women who remain.” She asks, “Are you a better mother if you stayed at home but suddenly can’t provide for your family?” in the event of a divorce. I will concede this is a valid concern and an unfortunate statement on where motherhood ranks on the list of “valued professions” in our capitalistic economy. If there isn’t a dollar value associated to what you are doing, then what you are doing doesn’t matter. According to a study released in May 2006, a full-time, stay-at-home mother would earn $134,121 a year if paid for all her work (http://www.signonsandiego.com/uniontrib/20060504/news_lz1n4read.html), but the reality is that most people look down on stay-at-home moms, thinking that their talents could be better utilized doing something else. “The 7 Myths of Working Mothers” by Suzanne Venker presents the completely opposite viewpoint of Bennetts’ book. Both are extremists at the opposite ends of the “mommy war,” no matter how much they protest that they are not attempting to add fuel to it. Venker does make some interesting points. The reality is that you either raise your children yourselves, or you pay someone to do it for you. The children may turn out fine either way and there still may be a very strong mother-child bond. However, isn’t it ironic that people value child care if you are caring for someone else’s children? Interestingly enough, Bennetts holds her own babysitter, Norma, in extremely high esteem, describing her as “a competent surrogate with impeccable judgment, someone I trusted completely to handle any situation as well as I would have.” No one would tell a day care worker or nanny that what she (or he) is doing isn’t work, but care for your own children and you have been relegated to the unimportant. Venker also makes note of the fact that many moms work part-time (this is what the vast majority of my own circle of stay-at-home moms do, myself included), and that the distinction between a stay-at-home mom and a “working mom” is that stay-at-home moms plan their work around their children while working moms try to fit in parenting around their work schedule. There is also the economic impact of working. Having both spouses working can actually result in greater expenses than having one spouse stay home. Once day care, transportation, clothing allowances, and other work-related expenses are taken into account, it can often cost more to work. Bennetts argues that the cost now doesn’t matter. Even if you are working just to pay for daycare it is still worth it because you keep your career intact. You won’t suffer the lifetime loss of earnings you will experience if you opt out for a time. She also argues that opting back in is not as easy as women expect it will be, a fact that is no doubt true in high-powered careers such as medicine, law, and the upper-level corporate world. However, the vast majority of women have careers outside of those arenas, where opting back in may not be as much of an issue. Insultingly, she also implies that stay-at-home moms are not people of interest. They have nothing to do with their time other than care for their children and their homes. As a result, when those jobs are phased out as their children age, they are left with an identity crisis and nothing to do with the rest of their lives. Bennetts is correct that stay-at-home moms do face economic consequences. Our retirement accounts don’t get contributed to and our social security benefits depend on our husbands. Wouldn’t it be better if the government actually supported the work mothers do by awarding mothers social security credits or if there was a tax deduction for being a stay-at-home mom? There is a child-care credit. Why shouldn’t there be a credit for actually caring for your own children? There is actually a bill in Congress that would do just that. The Parents’ Tax Relief Act (HR 3080, S 1305) would extend the Dependent Child Care Credit to stay-at-home parents with small children. It would also allow up to ten years of Social Security benefits to stay-at-home parents with children under six years old. So, then, what can women do to help protect themselves from economic disaster while at the same time staying home with their children? 1) Keep one foot in the working world. Keep your skills up to date, or take the time at home to pursue some continuing education. Work part-time, do freelance work, or volunteer in your field. That way, in the case of your husband’s death, disability, or divorce, you will have the skills and references necessary to re-enter the workforce on a full-time basis. 2) Be aware of your family finances. Some men attempt to shield their wives from any knowledge of the family income and expenses. This is not acceptable. Women need to be aware of assets and liabilities. They should also have some assets and liabilities in their own names, such as a checking account and a car loan payment. This will maintain a separate credit history. 3) Support legislation that supports women and families, such as the Parents’ Tax Relief Act. The answer to whether moms can afford not to work should not be to push women into the workforce when they would rather take on the challenging and rewarding (albeit exhausting!) work of raising their children. It should be to revise our social system so that women aren’t economically penalized for being mothers. In the United States, tomorrow is Memorial Day, a day to remember all those who have died but especially those who have died while in the armed services protecting our country. During war years, such as we are in now, this day is particularly poignant. I always feel somewhat ambiguous about Memorial Day. It is also considered the unofficial start of summer and is generally marked by barbecues (I went to one today) and pool and beach openings. There are also big sales at the stores. When I was young the stores were actually closed for the summer holidays - Memorial Day, Fourth of July, and Labor Day. Now they are just an occasion for more shopping. The true meaning of Memorial Day gets lost in the fray, even though there are still servicepeople who will line up in parades and masses to be said at cemeteries. Saying "Happy Memorial Day!" doesn't seem quite right. It really isn't supposed to be a happy day. It is a day to remember, to be thankful for those who sacrificed so that we might be free. In the May/June 2007 issue of Hallmark Magazine, there is an article about a woman who would write down all the good things her husband did for her. While I can't see myself actually writing the good things that Bernie does for me down on a daily basis, I think that it is a wonderful idea to remember the good things that your spouse does for you. It is so easy to focus on the negative and to get worked up by the little things your spouse does that annoy you. This is a good reminder to focus on the positive, and may very well be the key to a happier marriage. A few posts back, I wrote about how I was considering implementing a big change in my life. Today I took that leap of faith. I wrote a letter to David's school offering my services to create a program for gifted students. The impetus for this is my younger son Isaac who is several grades ahead in Math. He will be starting Kindergarten in '08 and I would like there to be something in place for him. I also feel there is a real need for it. No Catholic school in my area offers such a program. So, I wrote the principal a letter, took a deep breath, and delivered it today. I don't know what will happen. They may choose to ignore it and life will go on. Or they may take me up on my offer and I will be forced to rise to the occasion. It is in God's hands now. I know that I would have regretted not attempting to do something, however. Sometimes all you can do is take a leap of faith and trust in God that it will turn out the way it is supposed to. I was reading the June issue of US Catholic and came across a book review of "The Twelve Unbreakable Principles of Parenting" by Ann Lang O'Connor. The reviewer writes that "O'Connor advises parents to follow a regular schedule and established routines. Then, when faced with the inevitable 'But why?' parents have a stockpile of predetermined answers such as 'Because we always go to Church on Sunday.'" I couldn't agree more. Having rules and routines and sticking with them is much easier than making it up as you go along. It also limits arguing to some degree. My children know that on non-school days, they may have 2 hours of media time (computer and television). They have learned to plan accordingly by checking on the length of their favorite TV show or movie to see how they want to use their time. They are expected to be in bed at 7:45. They know this. While there are rare occasions where an event may make us push bedtime, they know that this is an exception. In fact, they will tell people that they are out past their bedtime. Routines bring comfort and stability. We all like to know to a certain extent what each day holds for us in terms of our usual activities. Children are no different. Deacon John P. Audia is a hearing Deacon from the Diocese of Rockville Centre, Long Island, New York. He is very involved with deaf ministry, however, serving as Chaplain for the Deaf Community. In "The Creation Story: In Words and Sign Language," he has worked with illustrator David Spohn to create a simple, beautiful book designed to introduce children to both the Biblical creation story as well as the American Sign Language needed to tell the story. but darkness, wind, and sea. On the facing page is a simple illustration of what was created that day. The colors used are very calming, predominantly blues, which make this a very relaxing book to look at. Children will love to look at the pictures and to learn the signs while at the same time gaining a deeper appreciation for God's act of creation. People tell me I have no sense of adventure. I can see their point. I have lived my entire life within a 20-mile radius. I didn’t go away to college and I have never traveled much. I did not plan my life that way, but any plans I had to get out to see the world just did not materialize. At this point, raising my two children is all the adventure I need in my life! Change is an ever-present reality. God and life always seem to throw curveballs. There is nothing wrong with change, especially if God is calling you to do something different with your life. Many times, though, people seek change simply for the sake of change. They are always looking for the next adventure. St. Augustine wrote “Our hearts are restless until they rest in you, O Lord.” That restlessness is part of the human condition. We tend to always be looking around the next bend to find our joy. When I graduate from college, things will be better. When I get a good job . . . When I get married . . . When I have a child . . . When the children leave . . . When I retire . . . The contentment that we seek always seems to be one step away. This reality holds true even for those of us who have not made a vow to a religious community. We may have made a vow in marriage to stay with our spouse “until death to us part.” The temptation is certainly there when things are difficult to think that life would be better with a different partner. Yet we can choose to focus instead on the good in our spouse and in our own marriages. We can choose to make the most of what we have. We may look at our daily work and become frustrated that we are not doing more, better, different work. We may become tired of taking care of the children and the house or the 9 –5 grind at the office. It is easy to think that life would be better anywhere else. Sometimes we might just want the world to stop so that we can get off and rest a bit. Each of us is called to bloom in whatever circumstances we may find ourselves in. We are invited to find our peace and joy serving God in the places where we live and work and pray. Well, David and I spent about an hour and a half studying his words yesterday for his test today (in 15 minute intervals). I had him fingerpaint them, write them in sidewalk chalk, hop on the letters while saying them out loud, and do a self-test where it would write the word and then check to see if he had it write. He wanted to get up early this morning to do his self-test again, which he did and I quizzed him on the way to school. Still, he wasn't getting the words right with any great consistency. I was proud of how hard he had studied, though, and I told him that. I hoped that he would get a 40% (I didn't tell him that!). When he came out of school and said that he got a 60%, I was thrilled! I was even happier when I checked his paper. He got "said" wrong because he wrote the letter "s" incorrectly and he had spelled "help" correctly only to then write an "a" over the "e" so I think that he did very well. And I am so glad that it is the weekend and he and I don't have to worry about spelling words again until Monday! Thank goodness that there are only 3 more weeks of school! I read about the Elder Wisdom Circle in the May 2007 issue of Real Simple. This is a "rent-a-grandparent" program for the internet age. You can submit a question for a wise elder to answer. In a society that so values youth, I thought this site which celebrates the wisdom gained through experience is a wonderful idea. My grandparents passed on to their eternal reward many years ago, but I have always loved talking to senior citizens. You can learn so much from them if you are just willing to listen. "God has done great things for me!" For Catholics, today is Ascension Thursday, a holy day in which we celebrate when Christ returned to his Father in heaven 40 days after Easter. Therefore, this morning, Bernie, Isaac and I headed over to Church to attend the 9 am mass. This is the school mass so David was there as well sitting right next to his eighth grade big buddy. Each school mass is hosted by a particular class - they are in charge of doing the readings, leading the songs, and bringing up the gifts. In addition, they generally do some sort of presentation that relates to the day. Today was the second-graders' turn. These beautiful seven and eight-year-olds who just recently made their first communion very reverently performed all of their appointed tasks. At the end of mass, they did a wonderful reading with hand motions about the life of Mary, appropriate since this month is dedicated to her. The theme of this tribute was "God has done great things for me and Holy is His Name!" - the words of Mary's magnificat spoken when she went to visit her cousin Elizabeth. Throughout her life she bore witness to those words, as she bore her child far from home, as she hastened to Egypt to flee from Herod, as she raised her child in Nazareth and searched for him in the temple, and as she urged him to begin his public ministry at the wedding at Cana. When she stood at the cross, the children stated that she almost questioned that which she held most dear, that "God had done great things for her" and she was forced to acknowledge that not only had "God done great things for her," but also that "God had asked great things of her." The pain that she must have had as she stood at the foot of the cross. And yet, three days later, her trust in God was proved as Jesus rose from the cross. The children ended the reading by pointing to all of us and saying that "God has done great things for us and Holy is His Name." Yes, indeed God has done great things for each of us. I'm inclined to think that like Mary, he asks great things of us as well. Admittedly, our sacrifices will most likely not come close to comparing to those asked of Mary. Sometimes, though, they can feel huge, like God is asking us to carry the world on our shoulders for a while. It can be hard to trust and hard to believe that "God has done great things for me!" It is at those times that we can look to Mary's example and work to keep our trust in God. Even when it is hard. Even when it hurts. Even when it seems like God is missing in action. We can look to the good in our lives, we can look to the very fact that we are alive and say that yes, "God has done great things for me and Holy is His Name!" Since the beginning of March, David's kindergarten class has had spelling words each week to learn - simple little words that children do need to learn like "at" and "go" and "in" and "out." For the past few weeks there were 4 words each week and David had studied and received a 100% each week and a designation as a "super speller!" which he was very excited about. Last week there were 5 words and he could never quite get his mind around "are." Most of the time we practiced, he spelled it "art." On his test he wrote "ape." So, he got an 80% which he didn't seem to be too upset about. This week, however, the words are even harder. Three of them have four letters and I am at a loss as to how to help him. Like I have with his other words, I have him write them three times each day and we practice out loud, but the poor boy truly doesn't have a clue. I try to have him sound them out, but words like "said" and "have" have silent letters that just need to be remembered. He asked me, "What happens if I try my best and I get them all wrong?" I told him as long as he tried his best, that was all we could ask of him. I did a Google search and came across this article: Helping your Child with Spelling which had many good ideas. I don't know how much it will help him by Friday, however. Please say a prayer to the Holy Spirit for my little boy to somehow remember these words. Thank you! Suzanne M. Harker wrote me to share the following information from www.TrinityShawls.com. I don't knit but this sounds wonderful for those that do. many people use our traditional knitting as a means to quiet their minds, of nourishing their inner being, for releasing their creative energy, for peaceful reflection, and for prayer. The repetitive movement of knitting is a way of quieting and refreshing us at the very same time. Most of us knitters leave a period of knitting refreshed and renewed through reflective knitting. Trinity Shawls is offering to those of us who knit in this way knitting instructions and prayer guidelines on the very same bi-fold page. This is a way for us to have suggestive ways to help and guide us in a way of knitting in prayer for prayer that we already do instinctively. The mission of Trinity Shawls is to offer professionally designed shawls in beautiful colors with Scriptural inspired meditations for our knitting in prayer for prayer. Martha Shawl is rose and green to symbolize life! Mary Shawl is a very soft pink to symbolize serenity! Martha/Mary Shawl is two shades of blue to symbolize peace! Lazarus Shawl is in two shades of gray to symbolize God's healing love! The first publication in the series is entitled Knit-to-pray with three shawl patterns are: The Annunciation (celebration is March 25th), The Visit (celebration is May 1st), and the Nativity (celebration is December 25th). The patterns of each of the three shawls are offered in two beautiful sets of colors for the Fall-to-Winter and Winter-to-Spring Collections. Both collections are in bright colors and patterns with prayer reflections based on the Sacred Scripture. Knit-to-Pray is a unique way for us to pray through reading the Scripture and meditating on the Scripture reflections while knitting in solitude and in groups. When our shawl is completed, we may use this shawl to create sacred space for ourselves or give it to a friend to continue the journey in praying, reflecting, meditating, and contemplating Sacred Scripture. My tulips lost the last of their petals yesterday which meant it was time to plant some new flowers for the summer. We went out after supper to our local garden center to pick out a few choice plants. David always loves to have his marigolds. They are a "must-have" for our garden. Isaac picked out some purple petunias. We also picked up a couple of perennials. Every year I try to pick up one or two to try to limit the number of plants we have to buy the following year. The boys also picked out some seeds to try to grow some vegetables. As soon as we got home, the boys asked if we could plant the flowers, so we spent a very enjoyable hour working together digging in the dirt. I love gardens even though I'm not very successful at growing them. Every time I put a plant in the ground it is an act of hope on my part. I say a prayer that they will grow! My friend Martha sent me this prayer today and I thought I would share it with all of you. Please feel free to copy it and send it to those you love. >>goings and their comings. In Jesus' precious name. Amen. Who are the silent angels in your parish community? Every morning before school, my children and I stop by our parish church to light a candle and say a morning prayer. When we first began these daily visits, I was surprised to see a small group of very dedicated individuals returning all of the missals and hymnals to their proper places in the pews. They are there every morning making sure that the church looks neat and orderly. I honestly had never thought about a person doing that. I just always took it for granted that wherever I sat at mass would have a missal and hymnal! It got me thinking about all the other volunteers who work behind the scenes to keep our parish running smoothly and looking beautiful, the people who decorate and water the flowers and make sure that there are always hosts in the tabernacle. There are those who make sure that the food pantry is stacked and those who count the money that is collected at the Sunday masses. There are those that maintain the parish web site and work in our religious education program, as well as the people who serve coffee and donuts after Sunday mass. There are those who bring communion to the homebound and visit the sick in the hospital. I’m certain that there are many more whose jobs I am not even aware of, but who are integral to our parish life. Then there are those who pray. There is a core group of people, primarily senior citizens, who faithfully attend daily mass and eucharistic adoration. They also manage the prayer line for any special intention anyone might have. They keep the spiritual life of our parish vibrant during the week while the rest of us are there only in spirit. I like to think that our prayers mingle with theirs as they pray and keep watch. Their work may often go unnoticed. No doubt most of the parishioners at my large inner-city parish rarely give them a thought. Yet, prayer is at the heart of any parish community and they may have the most important job. I once read that we may be very surprised when we get to heaven at who will have the greatest places of honor. It most likely won’t be the ones who had the spotlight here on earth, but rather those who went quietly along, loving God and serving their neighbor to the best of their abilities. There are saints who live among us and we might not even know their names or acknowledge their presence. Yet they are there, every day, sitting in their favorite pew, lifting up their hearts to God. They are there to visit the sick and water the flowers and provide food to the hungry, and we are so blessed to have them as part of our faith community. Indeed, what would we do without them? I envy Paul. He sees a vision and follows it, trusting that it is from God and that He should follow. When I get sudden inspiration, I overthink it. I weigh all sides of the issue, get bogged down in details, and in the process generally lose my enthusiasm for the idea. I question whether God has given me the inspiration or whether it is some misguided notion on my part. I torture my spiritual director with my indecision and pray, pray, and pray some more for some definite sign to come. I almost never feel sure in my decisions. Yes, I think we can safely say that if God had sent me this vision instead of Paul, the Macedonians might never have been told the good news. Just this week, I was sitting on my deck, reading a book, when I got smacked over the head with an idea for something I should do. This doesn't happen to me often when some radical new direction for my life suddenly seems like a good idea. I sat there and said, "Really, God, you must be kidding. Me?" I started thinking about the time involved in this project and whether I was qualified and whether the people I would need to work with would even be interested. And yet, the pull is still there. Should I be like St. Paul and follow the Spirit or should I stay in my comfort zone? Time to pray. "The Catholic Mass Revealed" is a new DVD that seeks to explain the Catholic Mass. You can view a preview of the DVD at http://www.catholicmass.org The site is flash-based and a high-speed internet connection is best. I just posted a wonderful review by Lisa Hendey of Joseph's Hands, a new children's book about appreciating our own gifts. It sounds like a message all of us need to hear once in a while. Dr. Timothy Johnson is best known as a medical expert for ABC news. What many people might not be aware of is that he is also a minister, having graduated from the seminary forty years ago. 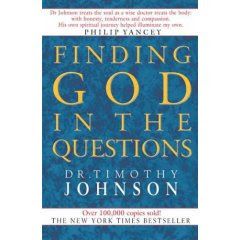 In “Finding God in the Questions,” he attempts to dig deeper into his own beliefs and how he has come to them. He is also attempting to integrate the spiritual and secular aspects of his life in a more meaningful way. Perhaps as a means of doing that, he is donating all his profits from the sale of this book to organizations that serve the poor and disadvantaged. Section One deals with “Does God Exist?” Dr. Johnson relies heavily on scientific evidence to make his case for his belief in an omnipotent intelligent being. One often comes across those who believe that science and faith are incompatible. For those who believe, however, an examination of our physical world only serves to reinforce that belief. At times, his scientific inquiry can be somewhat intense for those without scientific backgrounds. To his credit, he does tell readers they can skip those few pages of his book without losing the point of his book. Section Two focuses on “What is God Like?” Dr. Johnson offers a brief history of how the Bible came to be and then turns his attention to what one can learn about God by studying Jesus. He encourages people to read the Bible with fresh eyes, to simply sit down and read the four Gospels straight through as if it was your first experience with them (for some, it may very well be.) He believes many people will be surprised by what they find there. For example, Jesus says nothing against homosexuality, but preaches heavily against divorce. He speaks strongly against the accumulation of material possessions, yet many Christians seem to make this their prime goal in life. Also, “Jesus clearly shows more sympathy to the outcast and to the sinful than he does to the righteous and formally religious.” Johnson then goes on to discuss Jesus’ parables and miracles. Lastly, he investigates the Resurrection, coming to the conclusion that it was indeed a physical resurrection. Overall, Johnson’s inquiries will resonate with many. He brings his journalistic mind and medical knowledge as well as his theological background to investigate these questions. Time spent with “Finding God in the Questions” is put to good use. Order one or more subscriptions to Canticle before June 10 and receive one dollar ($1) off each subscription ordered! When you place your order, mention code SC07 to receive the discount. Heidi Hess-Saxton, editor of Canticle Magazine, posted this message on her blog today. Canticle is a wonderful magazine that I have been privileged to write for. If you can, please help them reach their goal. Yesterday I had an eye-opening e-mail message from Rita, our Vice President of Operations. I had wanted to spend $50 on a beautiful piece of artwork to illustrate a special story in an upcoming issue. Kindly but pointedly, Rita mentioned that the subscriber rates have not improved as we'd hoped they would ... Neither is the ad revenue at the level we would wish. And while there are no plans to disband "Canticle," neither is there money for nice extras like beautiful artwork. This was a little discouraging at first ... but then I decided to see it as an opportunity to exercise my faith muscles a little more. I'm asking God for 100 new subscribers in the next month. Will you join me in that prayer? Can you possible BE part of the answer to that prayer? So... I'm writing to you to ask you to consider sending a special Mother's Day gift to the mothers (both biological and spiritual) in your life. If you have been touched by an article in the magazine (such as the St. Elizabeth Seton article in our January issue, right), or even if you just can't think of what else Mom might appreciate ... Please consider blessing her with her very own subscription! You'll be glad you did ... and so will she. And so will I. When you order, please be sure to mention the notice on the blog. And thanks for your support! This Sunday, May 13th, marks 90 years since Mary first appeared to three young children in Fatima, Portugal. How appropriate that we will commemorate this apparition of our Mother in Heaven on Mother's Day! To read a history of the visits at Fatima, visit http://www.santuario-fatima.pt. Click on the British flag to read in English. Mary's message at Fatima, as it has been whenever she has graced us with her presence throughout the centuries, was a call to prayer and sacrifice. She especially wanted people to pray the rosary in order to bring about peace. It is a message as relevant to our world as it was in 1917. On the way home, somewhat shell-shocked that this was already happening in David’s life, I had a mental debate with myself over whether to allow him to call or not. I am friends with her parents so that weighed into the equation as well. I felt comfortable with him calling their house, but I wondered whether her mother actually wanted a little boy calling her daughter! I don’t want my child dating until he is sixteen but I know that at this age, there is nothing sexual in his feelings. He simply sees her as being someone special. I also know that his feelings are real and to dismiss them would be to do him a disservice. Eventually, I did allow him to call. I told him how to ask politely for her on the phone, and they ended up having a very pleasant three-minute conversation. He was so happy! The following day, I saw her mother at a social function and asked whether she minded that David had called. She said that it wasn’t a problem and that it had made her daughter’s day as well. This is not the first time David has fallen for a girl. At age two, he fell in love with a girl a year-and-a-half older than him. They played together from the time he was born and they were great friends. When she moved away, he was truly heartbroken. Whenever we would get pictures of her from her family he would look longingly at them and insist that they go in his scrapbook. The mere mention of the state she moved to would bring him to tears. This lasted for three years! I’m somewhat relieved that he is moving on. I never had a crush at such a tender age, but my husband did. He can recite the list of girls he liked from the time he was in first grade. Even now, at age 39, he remembers them with fondness. As he states, “I never thought girls had cooties!” I guess I know where David gets it from. Experts agree that a child's primary caregiver is her first love object. But then your little baby starts to grow up, and one of the ways she does is by focusing on someone besides, well, you. "This generally starts to happen in kindergarten or first grade, at ages four, five, or six," says Elyse V. Goldstein, Ph.D., a psychologist in private practice in New York City who specializes in relationships and intimacy. These early romantic yearnings are all a part of a child's first effort to move beyond the circle of her family. "A crush shows a child's willingness to separate from her main love object," explains Dr. Goldstein. This looking outward, in turn, helps a child define herself, to see herself as a person who exists beyond the family. It is good to know that this process is normal. I know in David’s life there will be many crushes. God gave him a very loving and sensitive heart. I also know that he will be heartbroken many times as well. As much as I hate to see that happen, I know that all these experiences will help him grow to be the man he will eventually become. The best I can do is to be there to celebrate in his joy of a new-found special friend, listen to his feelings, and be there when it ends to hug him and tell him I love him. "Where is that in the Bible?" by Patrick Madrid is the perfect brief book for anyone who has wondered what the Biblical basis is for some of the things that Catholics do and believe. "it is designed to be a handy reference guide, an overview of the major biblical passages that pertain to many issues that tend to come up between Catholics and non-Catholics." But even if you never use this book to debate with anyone regarding your faith, it is useful simply to have a deeper understanding of one's own faith. There are six main divisions to the book dealing with authority, doctrines, the sacraments, customs and practices, moral issues and non-Catholic beliefs. The chapter on "Authority" discusses the roots of the papacy, the authority of the Church, the role of tradition and the role of Scripture. "Doctrines" discusses Catholic's understanding of Mary, the mother of Jesus, the Trinity, Purgatory, salvation and more. The roots of the seven sacraments are covered in the chapter on "The Sacraments." "Customs and Practices" covers many of the practices that others may take issue with in the Church. For example, the role of priestly celibacy, tithing, and repetition in prayer. "Moral Issues" covers many of the hot-button issues of our day including abortion, divorce, and homosexuality. The final chapter "Non-Catholic Beliefs" seems somewhat out of place in the book, but it deals with why certain non-Catholic beliefs are not biblically based such as the claim of Jehovah's witnesses that only 144,000 will be saved. "Where is that in the Bible?" is not an exhaustive discussion of these beliefs and practices. Rather, it offers brief treatments with a few well-chosen Bible passages. It is a worthy introduction for those who have wondered about any of these issues. If you love me . . . This passage from John immediately follows the Gospel reading for today (John 14:1-14). Over the years, there has been much debate among Christians about what matters - our faith in Christ or what we do in terms of our actions. The truth is that the two are intimately connected. If we truly love and believe in Jesus, it will show in how we live our lives. We will love God and love our neighbor, not perfectly of course because none of us are perfect, but the attempt will be there. People should know we are Christian by the way that we live our lives. God doesn't want a perfect woman ~ Just a willing one! things had gotten so bad that even he despaired even of his life. good news is, there is a plus side to experiencing hardship. who has power and authority even over death. encounter. We commit every aspect of our lives to You. Amen.